Mr. Vikas Varma - Crush & Varma Law Group P.C. Vikas Varma received his Masters of Laws (LL.M.) degree, with concentration in International Business Practice, from Boston University School of Law. At Boston University, he was the recipient of the "Sebastian Horsten Prize for Academic Achievement". Mr. Varma has been the lead counsel in numerous acquisition and joint venture transactions for various US, Indian and multinational corporations. Mr. Varma regularly advises clients on start-up ventures and private placements. He has extensive experience in structuring and negotiating share-purchase agreements, joint ventures and cross-border business transactions, with emphasis on Brazil, South Asia and India. 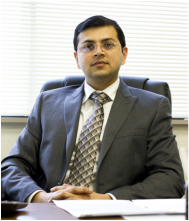 Mr. Varma's practice includes representing clients with interest in alcoholic and non-alcoholic beverage industry. Mr. Varma is the recipient of the "40 Under 40" Shaker Award from the Dutchess County Regional Chamber of Commerce, and "Rising Star" Award from Orange County Chamber of Commerce. He has volunteered as judge for moot court competitions for International Law Students Association and American Mock Trial Association. He also served as a member of the Board of Directors of New Hope Community, Inc., and Board of Directors of Leadership Orange. Sebastian Horsten Prize for Academic Achievement, 2007. "40 Under 40" Shaker Award from the Dutchess County Regional Chamber of Commerce. "Rising Star" Award from Orange County Chamber of Commerce. India Recognizes Limited Liability Partnerships - Any Attraction for U.S. Investors? PERSPECTIVE (NYSBA), Winter 2010. Singapore – India Comprehensive Economic Cooperation Agreement: A Major Leap Towards Free Economy Amongst Asian Countries, CHARTERED SECRETARY (Institute of Company Secretaries of India) Vol. XXV No. 11. Company Law Issues in Mergers, CHARTERED SECRETARY (Institute of Company Secretaries of India) Volume XXVI No. 3. SETH DUA & ASSOC., Joint Ventures & Mergers and Acquisitions in India – Legal and Tax Aspects, 9-157, 221-298, 417-435 (Lexis Nexis – Butterworths 2006).